Ahoy there, matey! What treasure might ye be looking for? Some pirate logos, mayhaps? Well then, you’re in luck cause we have gathered some excellent pirate logos for you, scoured from across the seven seas while surfing through the net. Wonderfully designed with different takes on a pirate design, this collection we made just might be you’re looking for. These expertly created premium logos, a perfect fit for a pirate-themed business or event, are thoughtfully designed and reasonably priced, although some you could download for free. If it’s a vast variety of logos that you want, head on over to our website for another collection of logo designs for you. Illustrators have taken different approaches to the pirate design, a theme so done that it’s been tried and spun every which way. Its classic black pirate hat and goatee is so recognizable that it’s considered vanilla. The designs we have in this collection aren’t nearly as outlandish as they could be with design components such as classic pirate heads, pirate skulls, crossed swords, or crossed bones and design approaches like geeky, pirate kid, sports, and games. 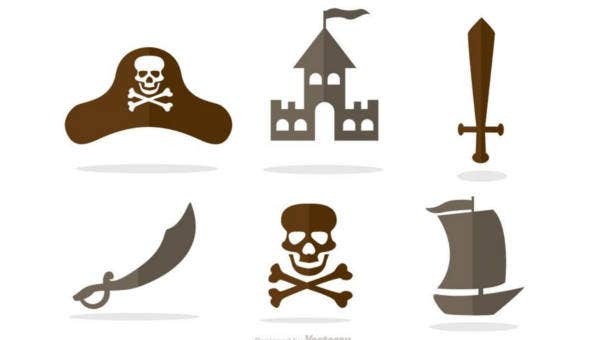 With the ways the designs are taken, there’s a variety of business establishments that these pirate logos can be used for. Toys and games, sports teams, or design and developer companies can make use of some of these pirate logos. Pirate designs have a cool feel about them. The way they’re often portrayed in popular media, pirates are awesome rebels. They play by their own rules without being too heinous in their crimes. Depending on the kind of company or team you have, that kind of image could do some good. Tech guys and younger generations tend to be fond of the that image too. Aside from cutlasses and rapiers, pirates used guns too. So check out these gun logos that you can download and use. The pirate logos in this collection are wonderfully designed by seasoned illustrators. They’re high-quality designs, and they’re available in vector formats like EPS or AI. Some of these are made with CMYK colors, so they come out looking good in print. All these are modifiable so you can tailor them to your needs as you see fit. Available to download for free or licensed at reasonable prices, you can try them out for yourself and your team or company. Dressing things up can be fun, and sometimes, it just works better that way. Evoking a certain attitude or strength or wisdom that certain things have to ourselves and to our groups or companies can have a little boost in morale and even unity among the members, inasmuch the same spirit as raising flags or dressing up like our favorite characters. Specific lifestyles, even fictional ones, sometimes make it as popular themes. Along with pirate themes, there are zombie, pilgrim, sailor, and cowboy themes that you can employ for whatever purpose. Cowboys were farmhands in actuality, but in movies, they were pioneers of the wild west, carving out into the land for more people to live. For a tough pioneering outlander image, have a look over at our collection of cowboy logos.